Andropogon ternarius Michx. Fl. Bor. Am. 1: 57. 1803. Andropogon argenteus Ell. Bot. S. C. & Ga. 1: 148. 1817. Not DC. 1813. Andropogon argyraeus Schultes, Mant. 2: 450. 1824. 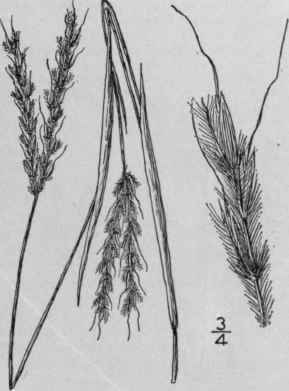 Andropogon Belvisii Desv. Opusc. 67. 1831. Andropogon mississippiensis Scribn. & Ball, Bull. U. S.
Dep. Agr. Agrost. 24: 40. 1901. Culms erect, 2 -4 tall, simple at base, generally much branched above; sheaths somewhat compressed, glabrous or pubescent; basal leaves 6'-1°; upper 2'-8' long, 1"-1 1/2" wide, acuminate, smooth to scabrous above, glabrous or pubescent beneath; racemes 1'-2' long, on more or less exserted slender peduncles; joints of the rachis and pedicels pubescent with long silky white spreading hairs; outermost scale of sessile spikelet 2 1/2-3 1/2" long, acuminate, scabrous; awn loosely spiral, 6"-12" long, scabrous; pedicellate spikelet reduced to a minute lanceolate acuminate scabrous scale, which is early deciduous. In dry sandy soil, Delaware to Missouri, south to Florida and Texas. Sept. Silver-beard. Andropogon Cabanisii Hack. Flora 68: 133. 1885. 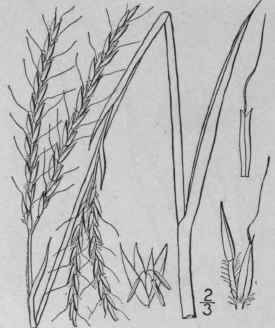 Culms 2°-3 1/2° tall, the branches in i's or 2's; sheaths smooth or a little roughened; blades 10' long or less, 1"-2" wide, smooth beneath, rough above; racemes in pairs on a peduncle which is densely barbed at the apex, 1 1/2-3' long, grayish, the hairs at the apex of the internodes about equalling them, rather scant; sessile spikelets 2 1/2"-3 1/2" long, broadly lanceolate, tapering from the middle, the first scale strongly hispidulous and 2-5-nerved between the keels, the nerves running the entire length of the scale, the fourth scale bearing a very slender awn 1'-1 1/4' long, slightly spiral at the base; pedicellate spikelets of a single hispidulous scale. In sandy places, Pennsylvania (according to Hackel) and Florida. Andropogon furcatus Muhl. ; Willd. Sp. PI. 4: 919. 1806. 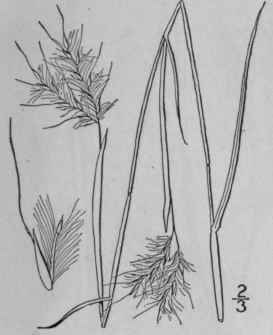 Andropogon provincialis subvar. furcatus Hack, in DC. Mon. Phan. 5: 442. 1889. Culms erect, stout, smooth and glabrous, 3°-6° tall, simple at base, branched above. Leaves glabrous or hirsute; blade's smooth or rough, 6'-18' long, 2"-7" wide, acuminate; racemes 2-6, in pairs or approximate at the summit, 2'-5' long; joints of rachis and pedicels ciliate with short hairs; outermost scale of sessile spikelet 3 1/2-5" long, twice the length of the rachis-joints, scabrous; awn 3 1/2"-7" long, perfect; pedicelled spikelet consisting of 4 scales. In dry or moist soil. Maine to Assiniboia, south to Florida and Texas and northern Mexico. Aug.-Sept. Broom-grass, Big Blue-stem, Blue-joint.